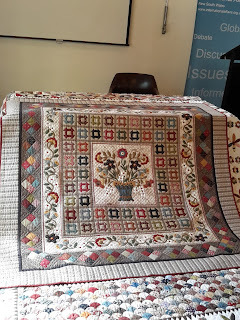 In April Rhonda Pearce gave a talk for the Quilt Study Group of NSW about her quilting journey and showed five of her remarkable quilts. She explained that she was a dressmaker by trade and started working when she was 15 for Sydney’s most famous fashion house, Germaine Rocher. The Sydney couture atelier was started by Germaine Rocher in the 1930s and was allowed to make a limited number of exact copies of some of the latest Parisian designers’ collections. There were only two treadle machines and, like the other 19 women she worked with, Rhonda sewed most of the garments by hand. 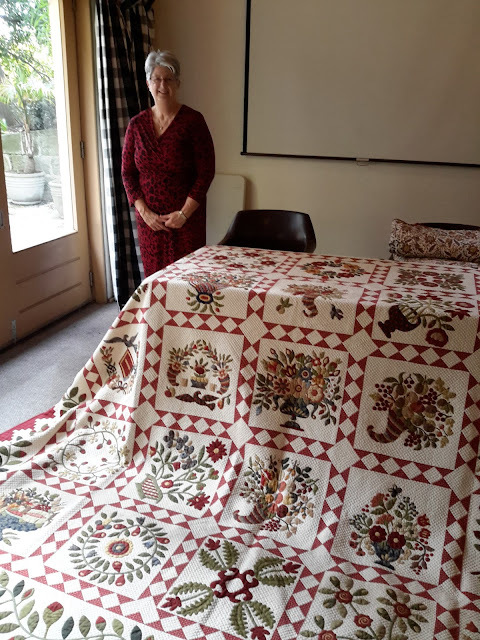 This is where she honed her skills, and explains both her love of hand sewing and why so many of her quilts have won awards both here and overseas. Rhonda’s only lesson in patchwork came from Val Moore, whose quilting tour of USA she went on in the 1990s. After she returned, Rhonda realised her dream of owning a patchwork shop by buying the local post office building at Glenbrook. She started with just 89 bolts of fabric and due to interest from her students, started making patterns of her quilts for sale. For this reason, Rhonda estimates she has made over 300 quilts, mostly samples for the shop. Now she enjoys the luxury of making only quilts she likes. Over the ensuing years Rhonda has developed many patterns and produced many outstanding quilts, including First Place in The NSW Quilters' Guild's "Professional, Traditional and Viewers' Choice 2007"category for her "Insanity" quilt, which has attracted a huge following, both in Australia and overseas. Although she does tend to use the same colours in her quilts, Rhonda said she never sticks to a fabric range and adds the odd quirky coloured fabric. In 2013 Rhonda took out First Place in the "Traditional Applique" category in Houston, with her entry "Baltimore Classic". Rhonda is a member of the Cocktail Quilters and 17 of the group went to Houston with her for the prize giving ceremony. She discovered she had also won the Viewer’s Choice award when she landed in Honolulu on the way home. The inspiration for this quilt came from a photograph in a book about the quilts in The American Museum in Bath. Rhonda said drew up the blocks using graph paper and decided it would be a Block of the Month. Most times she was only one step ahead of her students. 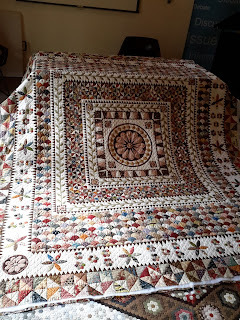 The top took her 24 months to sew plus 12 months of hand quilting (using 15-16 spools of quilting thread). 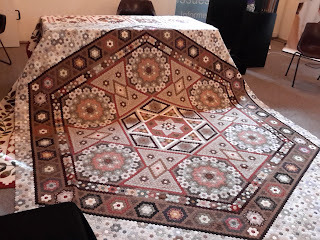 At 3 metres square it is such a large quilt that in order to fit the hangers at Houston, the sleeve had to be put on part way down the quilt. Rhonda likes to use mainly reproduction fabrics and tone on tones. She prefers to applique using the freezer paper on top, needle turn applique method using a blue wash out pen. She transfers her design onto the fabric she is appliquing on, but marks only as much as she can sew that night. At the end of the night the block is immersed in cold water, rolled up in a towel and spread out to dry overnight. 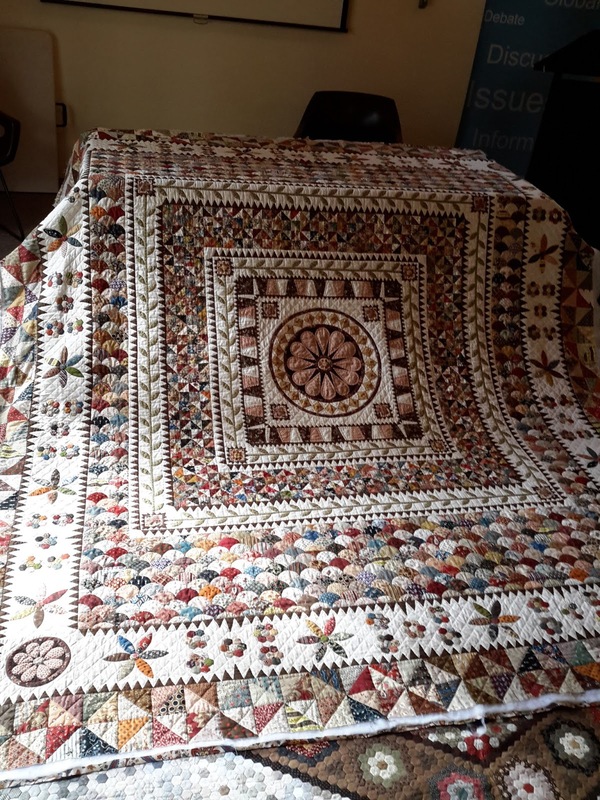 When asked for more details, Rhonda told us that she doesn’t prewash her fabrics, uses Gutermann thread for applique and hand quilting, uses a thimble for quilting and a short needle. She has a Clipfast frame for her quilting and balances it on the arm of the chair. 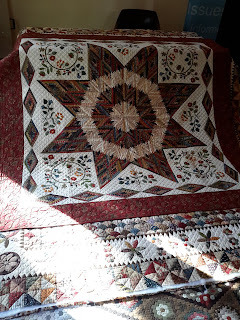 She does a lot of crosshatch quilting and said that she doesn’t like quilts which are overquilted. Rhonda then showed us an amazing quilt top she has made of 15,000 half inch hexagons for a grand daughter’s 21st birthday. She reuses her hexagons and said she only bought 300 to do the whole quilt. She will probably quilt it by ditch stitching around each hexagon and hopes to show it in Paducah. 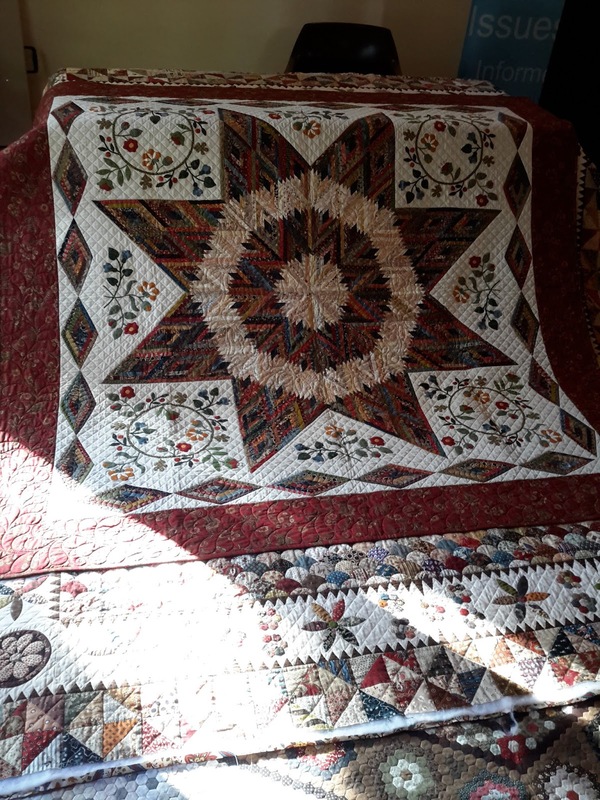 Rhonda’s newest quilt, “The Glenbook Star”, has a foundation pieced log cabin centre using quarter inch strips from her stash of left over fabrics. 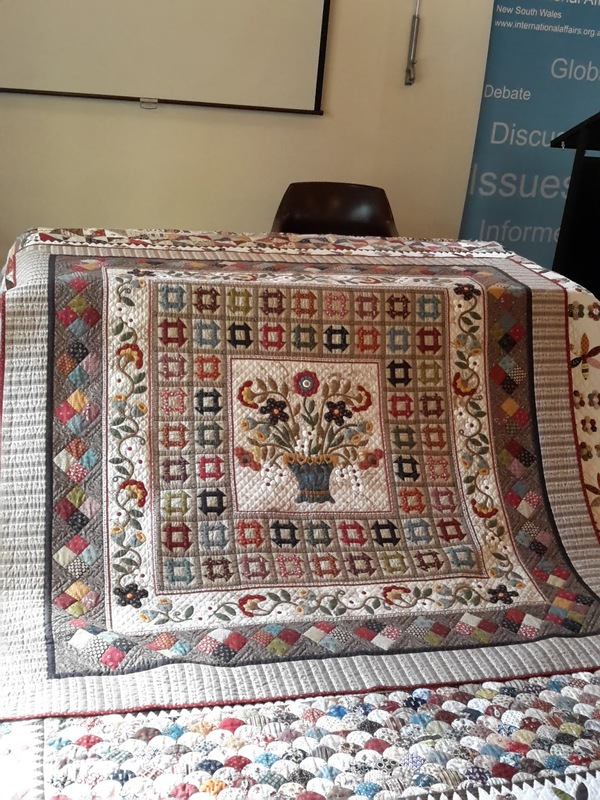 Still another quilt brought was based on the “Ann Randoll Coverlet Quilt” which was in the recent V & A Quilt Exhibition. The centre was appliqued onto a circle of fabric, a bias strip was sewn on and then it was appliqued to the quilt top and the fabric cut away from the back. She quilted it using Hobbs Poly-Down batting. WOW! I am highly impressed. Such dedication to completing such beautiful creations. Thank you for sharing the photos & details of Rhonda's talk. The album style quilt is gorgeous. I enjoyed seeing her quilts. 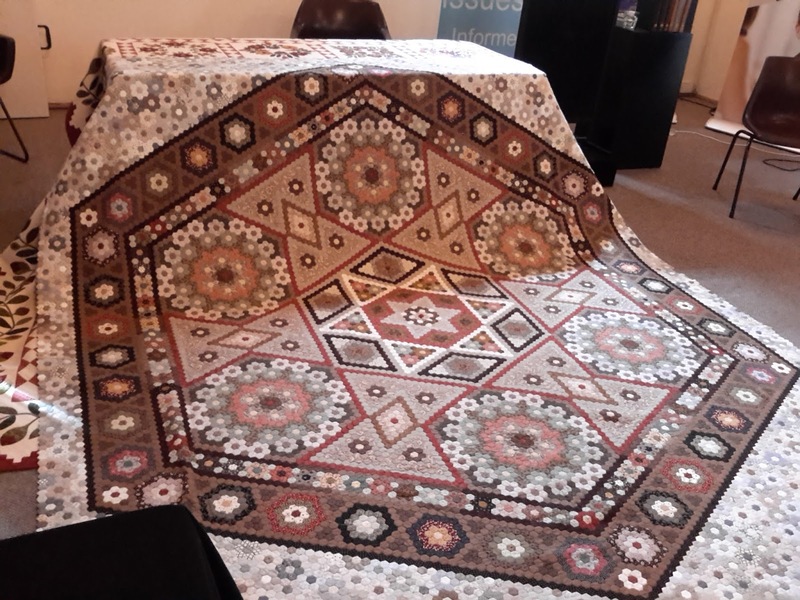 All the quilts you show are once in a life time quilts. And here she has a half dozen!!!! !